Place a medium saucepot over medium-high heat with the beef stock and ancho chili peppers. Bring the liquid to a bubble, then reduce the heat to medium and simmer for 15 minutes, until the peppers have softened. Transfer the mixture to a blender or food processor and – very carefully, this mixture is very hot! – puree until smooth. Reserve. While the peppers are simmering, place a large, heavy-bottomed pot over medium-high heat with two turns of the pan of EVOO, about 2 tablespoons. Add the sirloin and cook until golden brown, 6-7 minutes. Add the onion, garlic, raisins and spices to the pan; season with salt and pepper and cook until the veggies are tender, 5-6 minutes. Add the tomato paste to the pan and cook until deep golden brown and aromatic, about 1 minute. Add the blended stock-chili mixture to the pot and bring the liquids up to a bubble. While that’s working, in a food processor, combine the cilantro, avocado, sour cream, lime zest and juice and a splash of water (a couple of tablespoons). Season the mixture with salt and pepper and puree until smooth. Pre-heat the broiler or turn a gas burner on high heat and roast the poblano pepper until it is soft and its skin is charred. Place the roasted pepper in a bowl, cover tightly with plastic wrap, let cool and chop. Place a large skillet over medium heat. Add one tortilla to the pan and cook about 1 minute per side, until it starts to blister. Scatter 1/2 cup pepper Jack cheese on top and cook until the cheese is melted. Top with the chopped poblano pepper and a second tortilla. Flip the quesadilla and cook for another minute, then slice into quarters. Add the avocado mixture to the pot of chili, stirring to incorporate. Serve the chili garnished with toasted pumpkin seeds and a little cheese with the quesadilla alongside. In Recipes-list.com we have selected the most viewed recipes from category - uncategorized . Enjoy the best recipes specially selected for you! 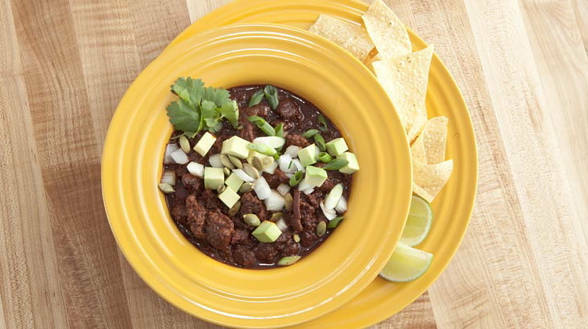 Ancho Beef Chili is the right choice that will satisfy all your claims.